Raccoons can be adorable, with their little facemasks and ringed tails. 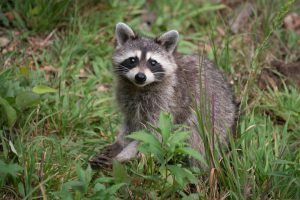 They can also be extraordinarily destructive and carry deadly diseases so if you have raccoons living in your home, it’s time to call the experts at Twin Forks Pest Control. Most of the time, raccoons are just a mere nuisance in their constant search for food, tipping over garbage cans and ripping plastic bags to shreds as they search for food. But they have very sharp teeth and claws, and can rip through wood and metal screens with ease. Raccoons are known to be very clever and can learn how to perform tasks like unscrewing jars, uncorking bottles, and opening door latches. They can fit into small holes and will take up residence in soffits, crawl spaces, and ceilings to build nests and raise their young, with a litter of anywhere from 2 to 5 babies. Raccoons present a very real danger to humans and their pets. They are well known for carrying rabies, which can kill both people and animals. Humans infected with rabies have to undergo a very painful course of treatment. Domestic dogs and cats need to be euthanized when infected and the virus will typically kill them within a week. Raccoons carry a roundworm known as Baylisascaris procyonis, which infests human body tissues including in the stomach and intestines. The roundworms can cause neurological problems and even blindness. Raccoons can also transmit leptospirosis, a deadly disease that can cause liver failure, respiratory problems, meningitis, and even death. Protect your family and your home or business by getting rid of raccoons and any other pests. Our wildlife removal experts humanely trap and remove whatever animals are invading your home. Our work is guaranteed so you don’t have to worry once we leave. Give Twin Forks Pest Control a call today at 631-287-9020 to schedule your free estimate. Whether you’re in Greenport or Eastport, Twin Forks Pest Control can help!